KIEV, Ukraine -- The Kremlin on Friday warned that the arrival of several hundred American military trainers in Ukraine could “destabilize the situation” in the country’s southeast, where a cease-fire between government troops and Russian-backed separatists is barely holding. On Friday, the United States Army announced that about 300 troops from the 173rd Airborne Brigade, based in Italy, had arrived in western Ukraine this week for Operation Fearless Guardian, a six-month training rotation for three battalions of Ukraine’s National Guard engaged in combat duty. 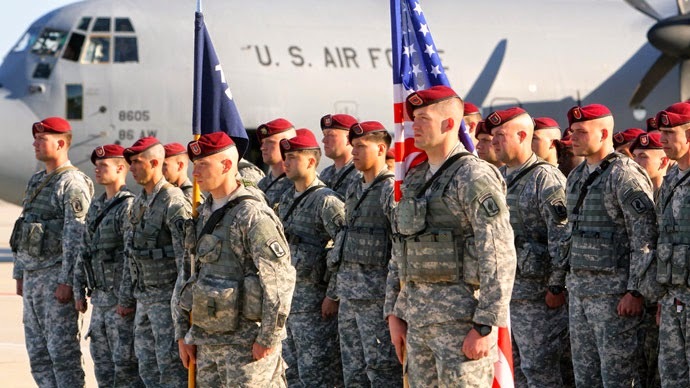 It is the first training mission by American troops in Ukraine since the war in the southeast began. The training program is modest assistance to Ukraine’s war effort, falling short of the lethal aid, like sophisticated antitank weapons, that Ukrainian politicians and soldiers on the front lines have requested from the United States. Last month, the Obama administration announced that it would give an additional $75 million in aid to Ukraine’s military, but that did not include the weapons that many administration officials and Democratic and Republican members of Congress have urged President Obama to provide. In remarks on Thursday, President Vladimir V. Putin of Russia said that any Ukrainian offensive would be unsuccessful. On Friday, Dmitry S. Peskov, Putin’s press secretary, delivered a sharp warning in response to the arrival of the military trainers. “The participation of instructors or specialists from third countries on Ukrainian territory, where the domestic Ukrainian conflict is unresolved, could destabilize the situation,” Peskov told reporters. The Kremlin’s warning came despite a large body of evidence, including the unexplained deaths of more than a dozen Russian servicemen in eastern Ukraine, that Russian soldiers and advanced weaponry were already there. Asked on Thursday to comment on the extent of Russian support for the separatists, Putin said there were no Russian soldiers in eastern Ukraine and moved on to other topics. The White House rebuffed a request for weapons from President Petro O. Poroshenko of Ukraine in September, announcing an additional $53 million nonlethal aid program instead. Obama has signaled privately that he is reluctant to arm Ukraine despite increasing pressure from both parties in Congress. Russian officials regularly blame the West for provoking the conflict in Ukraine, and in February, Putin said he had proof that the West was already providing weapons to Kiev. State and pro-Kremlin news networks have broadcast many lurid and dubious accounts of Western interference, including breathless stories of dark-skinned and English-speaking paramilitaries terrorizing local residents in eastern Ukraine. Several dozen British soldiers began conducting military training last month, and Canada and Poland have pledged to send military trainers this year.